Some of the highlights in this video are detailed below. 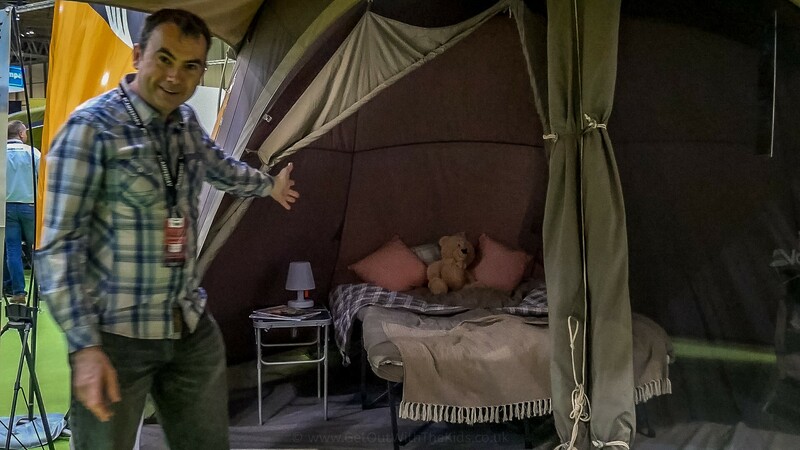 This was a large tent on display at the show. 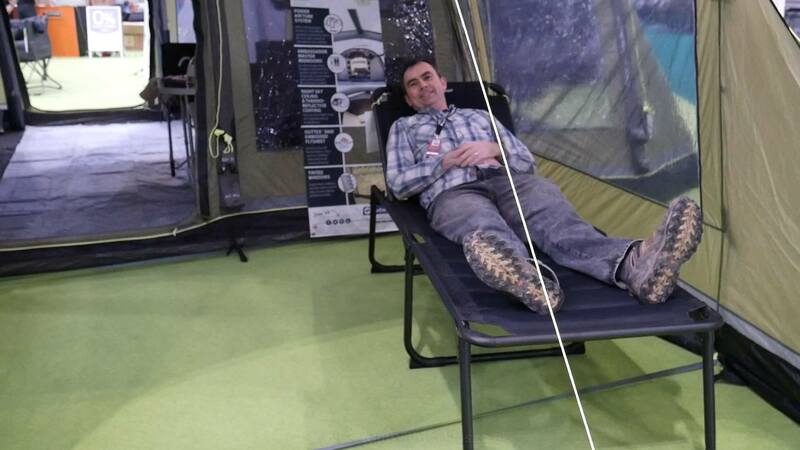 It’s using Outwell Smart Air inflation system, where you only have to inflate the tent from one point. It also has their Technical Cotton, giving it that more traditonal canvas feel. This is a very large, ideal for creating a home form home for a camping holiday. Further details of this tent can be found by clicking here to see it on the Outwell website. Sticking with the inflatable theme are these range of inflatable sofas from Outwell called Lake Superior. The inflatable Outwell Lake Superior sofa sitting inside the porch area of the Greycliff 7SATC tent. These sofas come with a built in pump to make it easy to inflate and deflate. Unlike some other inflatable sofas that you can get, these have a fabric cover, giving you a bit more of that home-style comfort while your family is camping. 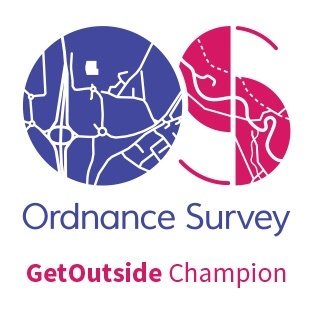 Details can be found here on the Outwell website. This is a large and impressive looking coolbox. 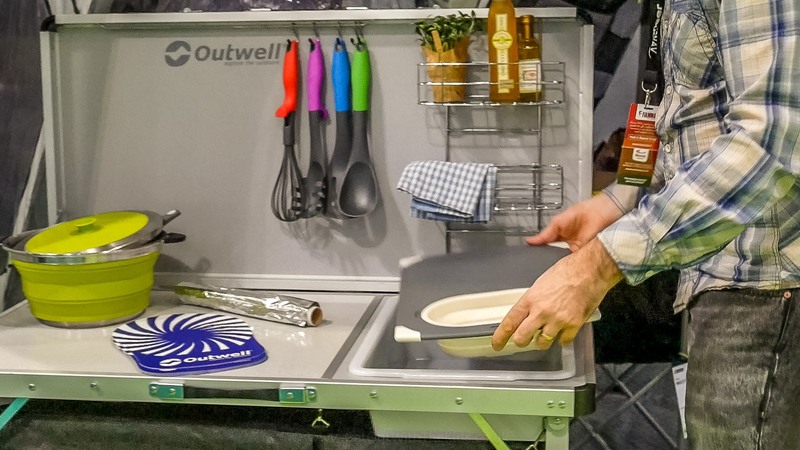 The Outwell ECOlux 35L, with the ice pack divider. It was at the show in white, complete with a bamboo trim on the metal handle, making it look quite sophisticated. 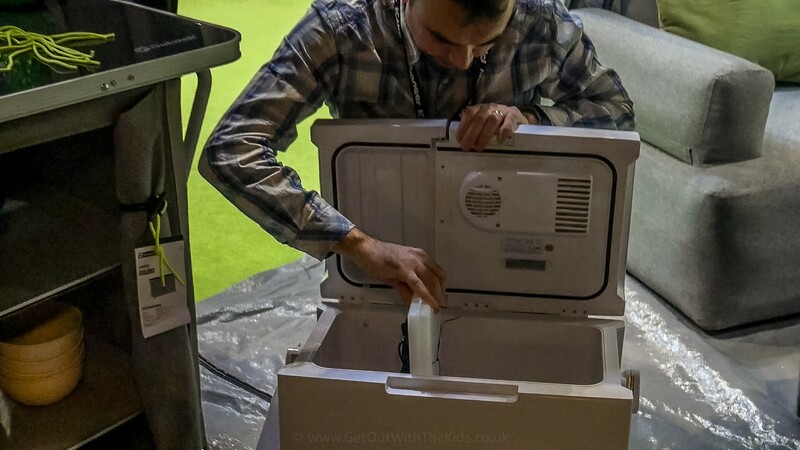 The lid of this powered coolbox is split, making one compartment easy to get things out of without losing the cool air in the main compartment. You can even charge USB devices from the coolbox! Another neat design feature I like with this is the divider inside the coolbox is an ice pack, which further helps keep things cool. Further details can be found on the Outwell website. I must admin that I’ve never really got into trailer tents. Normal tents of all shapes and sizes: yes. Caravans: Yes. Motorhomes: Yes. But trailer tents: No. However, the Opus Camper could really change that, and is something that looks right up our street. The layout is all self contained within the trailer, though you can get an extension if you want more living and sleeping space. 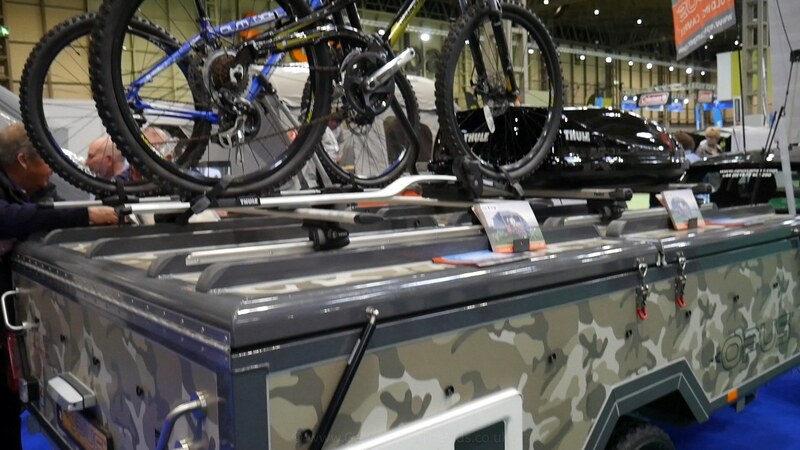 When its all folded up, the trailer is a place to transport canoes and bikes. It’s bit of an adventure wagon. The Opus Camper packed up and ready for another adventure. 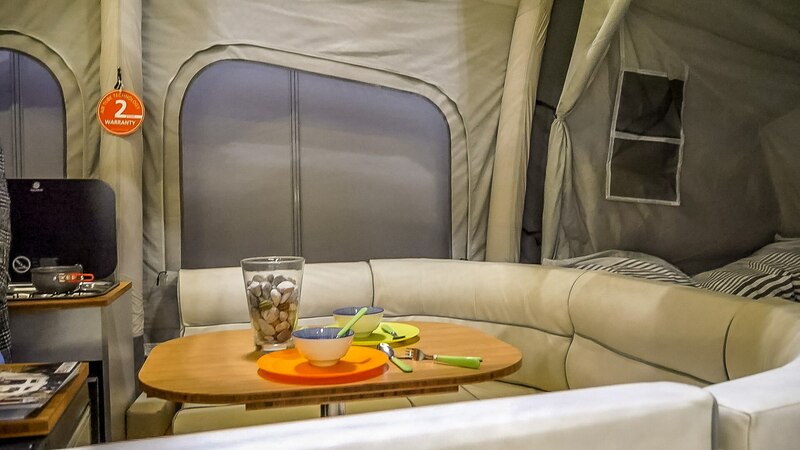 Inside the Opus Camper you have a kitchen, seating and eating area, and two double beds. Click here to view details on the Opus website. Another big family tent at the show was the Outwell Corvette, complete with an additional side awning on display. More details can be found on the Outwell Website. Here’s a rather funky accessory that was on display inside the Outwell Corvette 7AC tent. 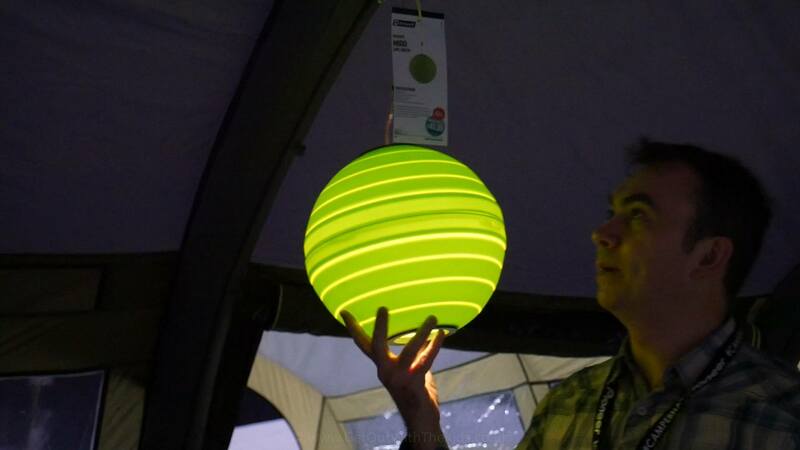 It’s a new collapsible lantern, called the Outwell Mira. This light for the tent, the Outwell Mira, collapses and folds flat for transport. You can also see the other colours it comes in on the Outwell website. The Outwell Hornet 6SA is a newer version of our old Outwell tent, the Hornet XL, which we absolutely love. 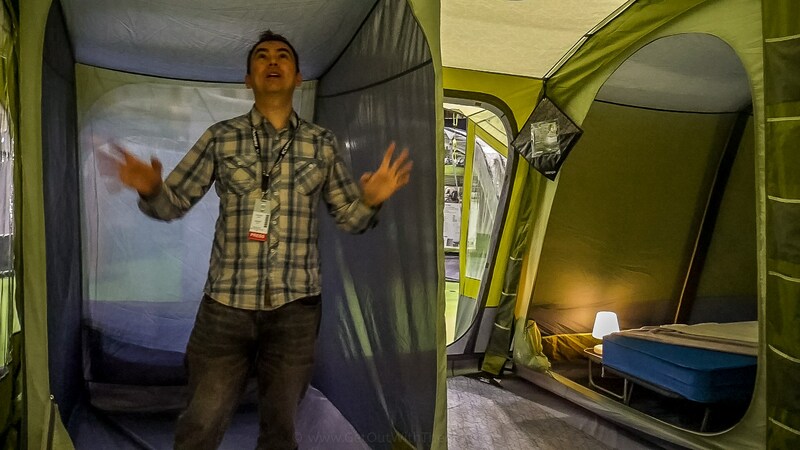 This tent is big enough for family camping holidays, but is not too big for weekend camping. We really like the porch area, and on the 6SA the covered side door (which we didn’t have on the older model). 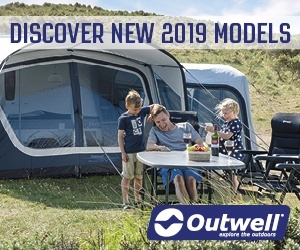 For more details on this tent, have a look at the Outwell website. 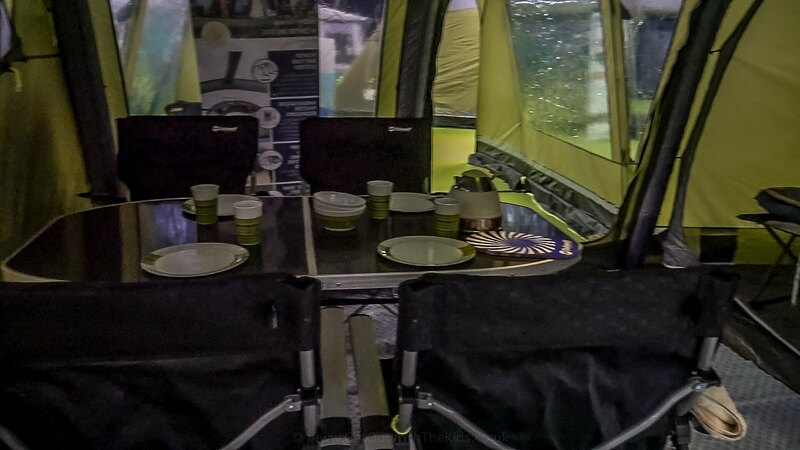 In the porch of the Hornet 6SA tent was the excellent Outwell Drayton kitchen table. This is something we’ve reviewed before. The specs for the Drayton kitchen table can be found on the Outwell website. 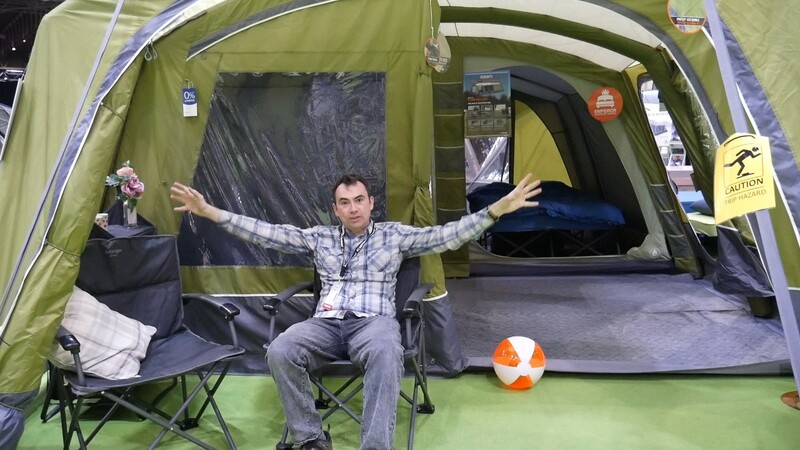 Continuing with the theme of large inflatable family tents was the Outwell Vermont 7SA. 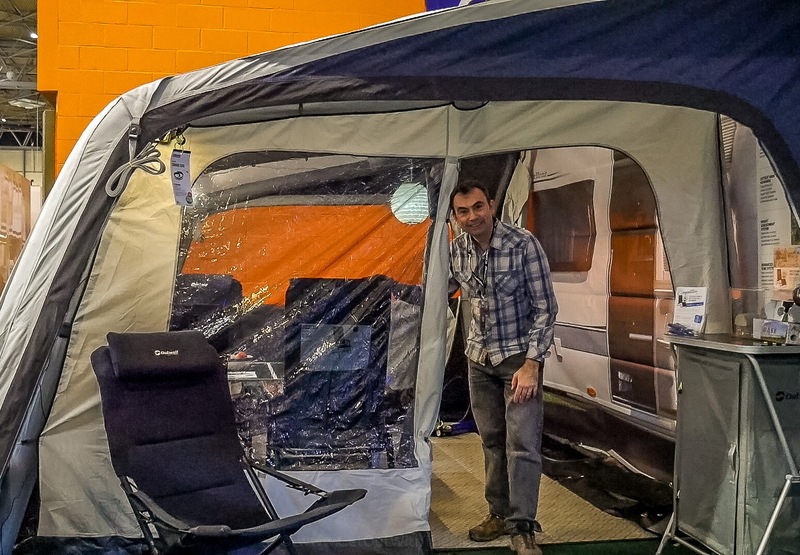 The super large Outwell Vermont 7SA family tent.  If you are planning a week or two camping with the kids, then this tent is like a little holiday home. It has a large enclosed porch area, where you can remove the groundsheet if you want. Then there’s a second living area, that comes with a built-in wardrobe. And finally, there are the extra large bedrooms. The built-in wardrobe space in the Outwell Vermont 7SA comes with a hanging rail, plus there’s enough space for a clothes cupboard and bags on the floor. 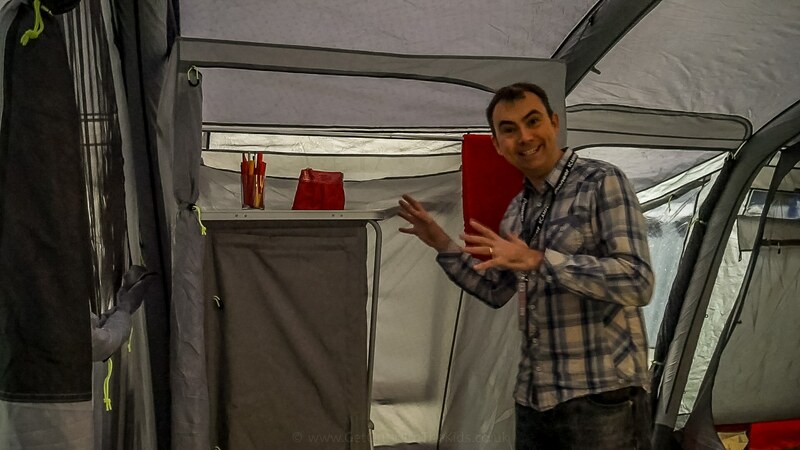 More details and videos of this tent can be found on the Outwell website. 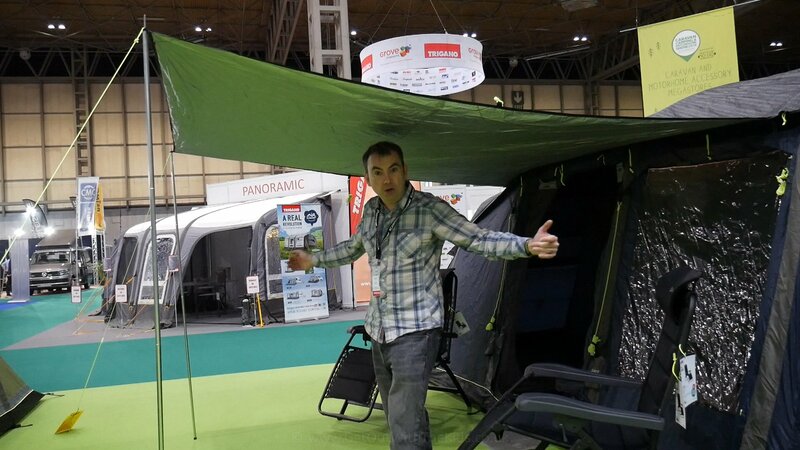 At the show was the Outwell Clarkston 6A tent. This was on display with the dual protector. This not only helps protects the roof of your tent from bird muck and muck when pitching under or near trees, but the protector comes with a reflective barrier to both help keep more heat in the tent when it’s cold, or keep the heat out when it’s hot. Plus, a feature I really like, the protector has an additional flap that can be extended out over the side door to create a useful additional sheltered area for your family. For more details, visit the Outwell website. 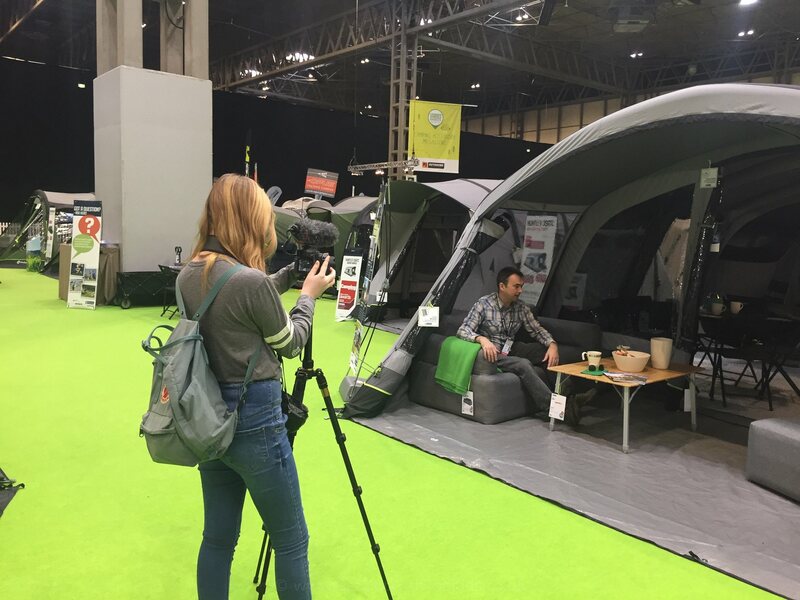 The Vango Serenity also has a layout we like, with a front porch area that’s ideal for sitting out or just providing a bit of shelter to your seats at night. 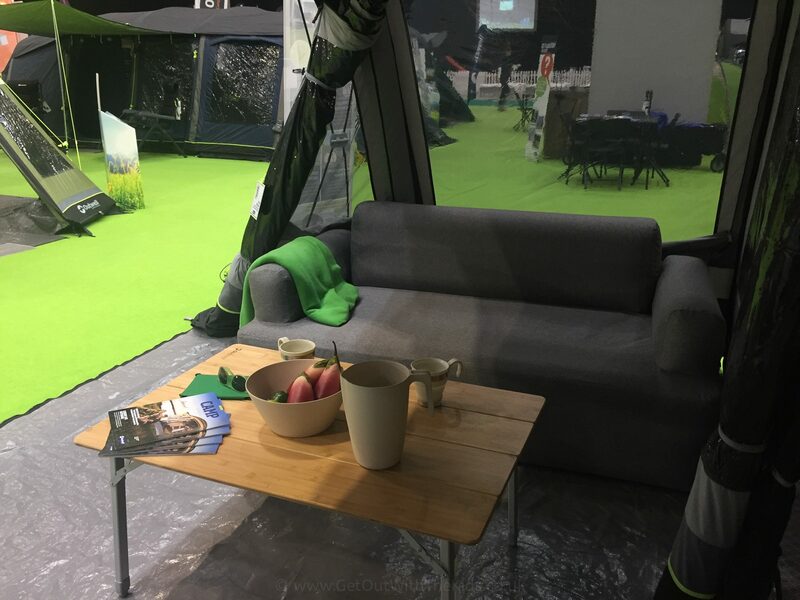 The Vango Serenity tent also sports a front porch area to sit. Inside the tent you have a little bit of flexibilty for the sleeping arrangements, with an additional bedroom that you can add. 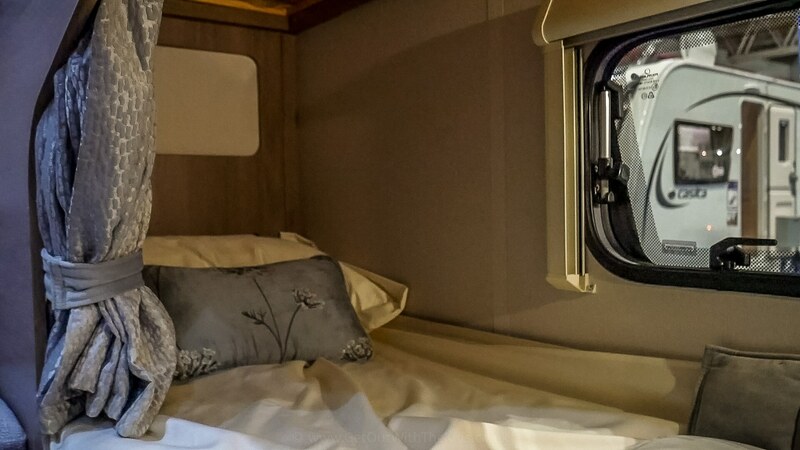 The extra bedroom in the Vango Serenity can be removed if not required. For more details, visit the Vango website. This year Vango have brought out a new range of thick sleeping bag with their own take on the easy inflate/deflate valve. The mats are called Shangri-La. 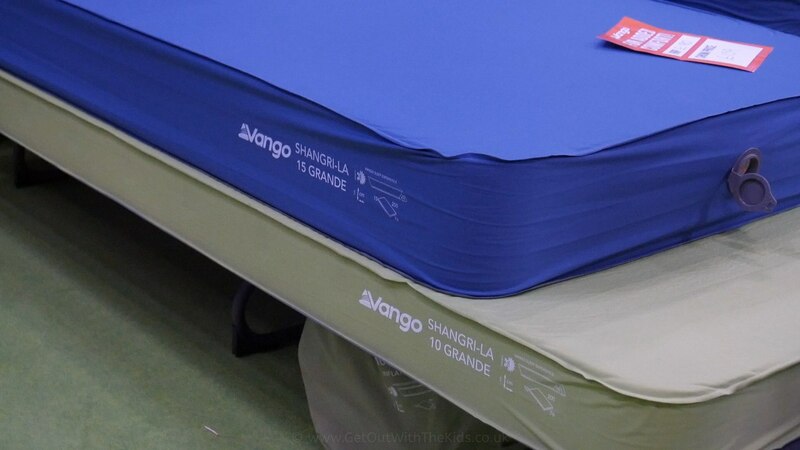 The extra thick Vango Shangri-La self-inflating mats. For more details, see the Vango website. 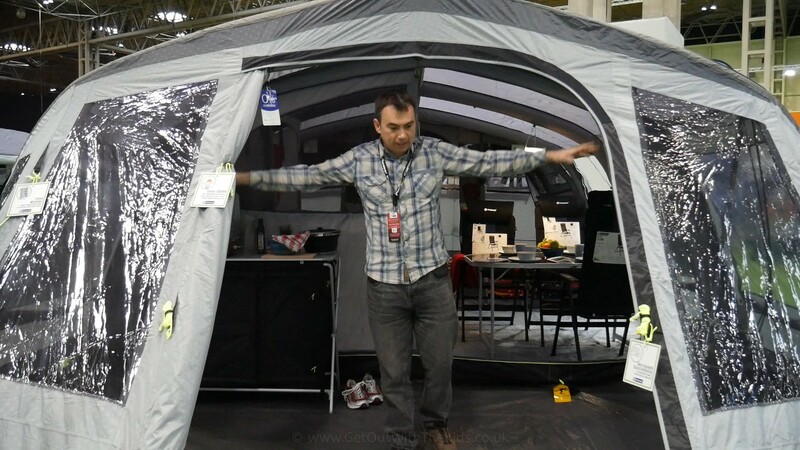 An interesting looking tent we saw at the show this year was the Vango Rosewood. This unique shaped tent is ideal if you want to go full-on glamping. 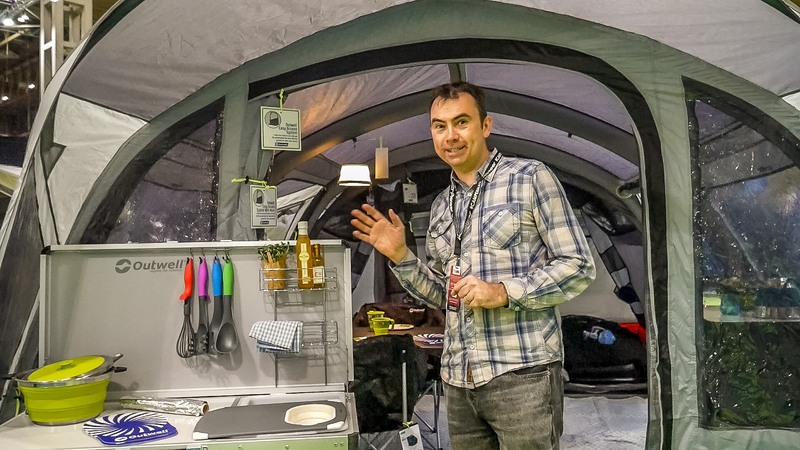 The details of the tent can be found on the Vango website. It was nice to see the caravan we’ve just bought (yes, we bought Casper!). 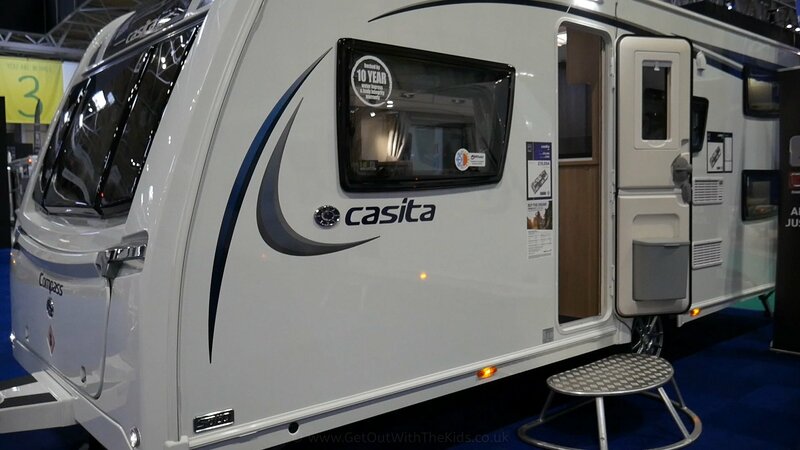 Next to our model of caravan was it’s big brother: the Compass Casita 866. This is a wider van and a twin axle – and still a family style van, with two built in bunks for the kids at the back of the caravan, and even their own seating area. The wider Casita 866 has a larger seating area. It also sports a fridge freezer. Here’s one of the bunkbeds for the kids in the Compass Casita 866. 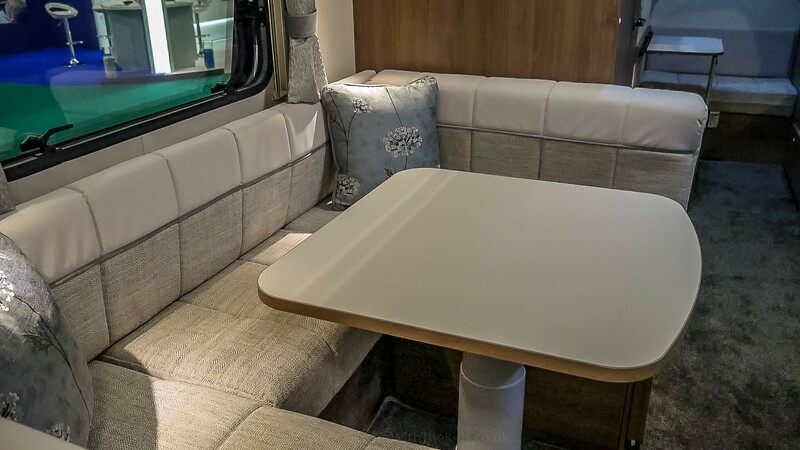 For details of the Compass Casita range, visit the Elddis website. 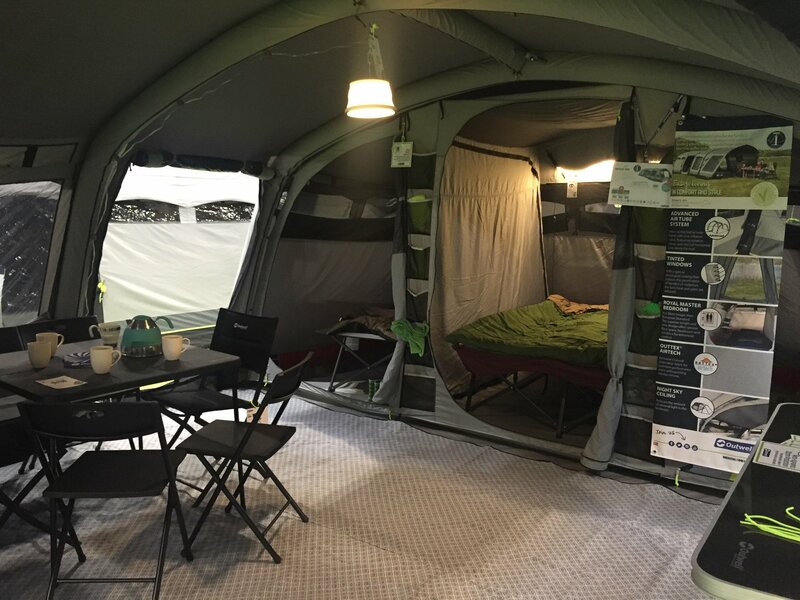 We’ve been using an inflatable awning for our caravan, but it was nice to see a slightly different design at the show this year. This from Outwell, but it doesn’t look like an inflatable tent on the side of the caravan. Instead, it looks like a modern take on the traditional caravan awning. However, this one you can simply inflate to put it up. The Outwell Tide awning has a sheltered porch area as well as an enclosed part. 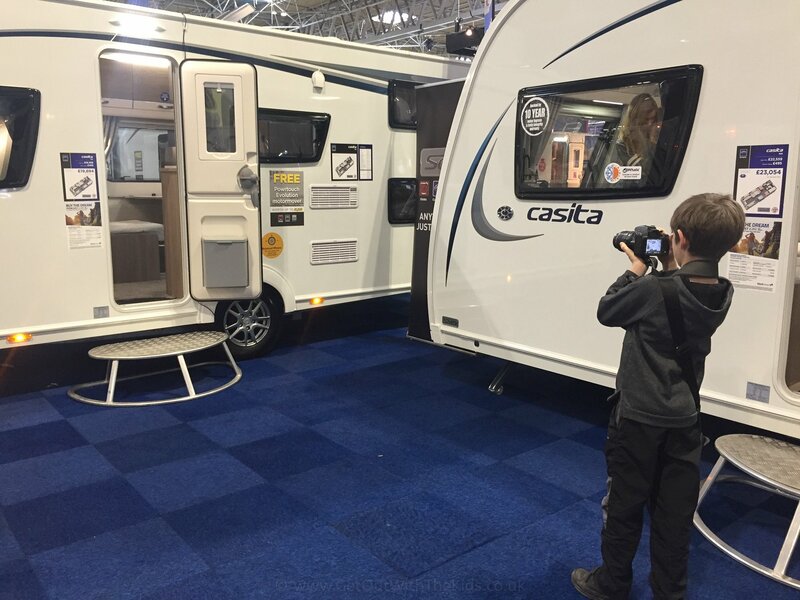 One of the problems we’ve had when looking at a motorhome for family use is finding one that can take everyone. It’s not necessarily the number of berths that’s the issue, but the number of seat belts. I’ve seen far too many motorhomes described as for the family, with 6 berths, but could only drive with less than that. I was really pleased to see in the Autoquest that it had the right number of seat belts for the right number of berths. In this case, the 196 looks like it would be ideal for a family, where all can sit around the table while travelling on their adventures. Each of these four seats have seat belts. More details can be found on the Elddis website. 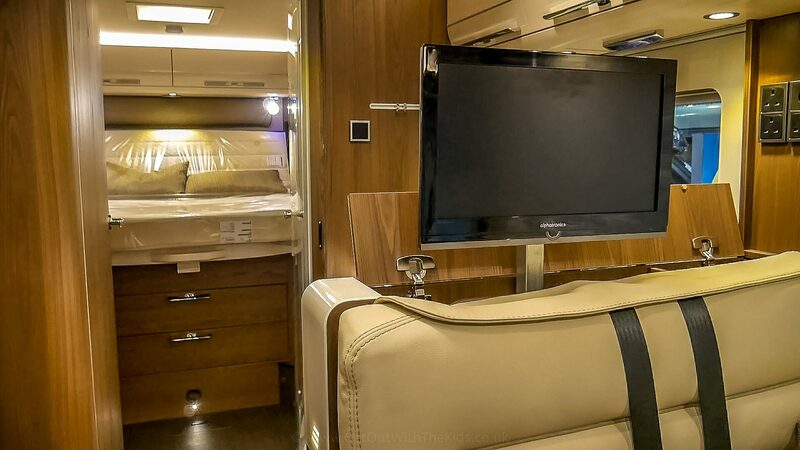 OK, maybe not your typical family motorhome, but we thought we’d see what some of the top end motorhomes look like! 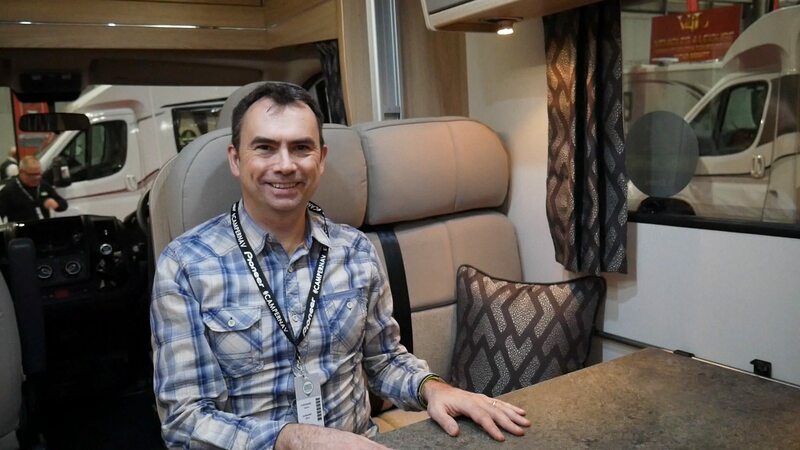 The Hymer B Class Supreme is not what you would class as a family motorhome, but great to see what you get in a top end motorhome. Of the course the show had lots more stuff, but there’s only so much I can cover in one post.